Tonight I'd like to review "Big Chuck! 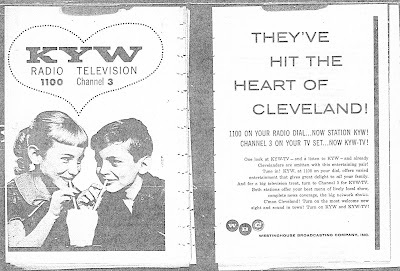 My Favorite Stories from 47 years on Cleveland TV" Published by Gray and Company, publishers of many books about Cleveland and it's personalities in the last several years. Written by "Big Chuck" Schodowski with Cleveland Plain Dealer Columnnist Tom Feran.. The Book reads as if Big Chuck is sitting next to a group of friends, having a cup of coffee or other favorite beverage. He tells of being a sickly youngster, growing up in the lower middle class Harvard/East 71st street neighborhood in Cleveland. He gained a good work ethic early in life delivering the Cleveland News, then the Press, before he was a teenager.. He tells of working in a Foundry for 8 years, befriending his black co-workers, who gave him appreciation for Jazz and Blues Music, which would be a hallmark of his early work on "Ghoulardi"
Realizing he ddint want to work in the Foundry for his whole adult life, Chuck took his first class radio license classes, one day a week for 3 years, Leading to a summer job as a Camera Operator for KYW-TV 3 in 1960. Despite some early mishaps, he won the respect of his TV 3 co-workers by the end of the summer. He was recommended for an engineer's job at WJW-TV 8. The bulk of the book, of course is about his career at TV 8, where he says he never was told he was a permanent employee. 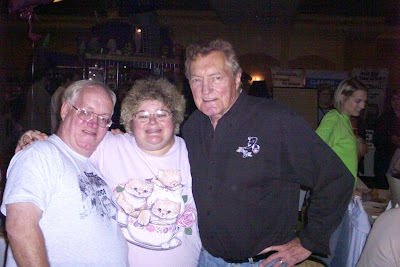 when Ernie left for California..The Ghoulardi/Big Chuck/Lil John All Stars when everybody had a good time, or else..LOL..some wild stories there..
Then to the Hoolihan/Big Chuck years, the skts (2000 produced over the years)..Celebrities Chuck worked with, that respected Chuck, even in doing silly things..Becoming producer/director at TV 8, even doing movies for Storer Television.. There are very good pictures throughout the book all put in their proper conterxt.. 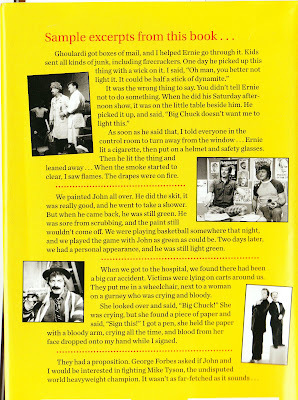 The Gray Co. description says that Chuck's writing style is "Cleveland to the Bone". 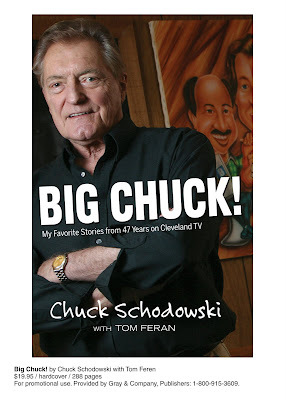 Very good description of Big Chuck, who says in the Introducktion he was "Born and Died in Cleveland"
This is an excellent book, especially if you are a fan of the WJW-TV 8 Horror Host tradition spanning 44 years..If one is just a fan of Local Television. this is a book you wont be able to put down. As much as Chuck told, there seems to be so much more he could tell in a second volume..
Look over some of their other books..A lot of Interesting Cleveland/Northeast Ohio subjects.. Here, from December 23, 1976, is Jan Jones (known then as Jan Paulich Jones) hosting 6PM City Camera Weather..With her are Jim Hale, Jeff Maynor and Jim Mueller on Sports..Ms. Jones' Smiling face has been on Cleveland TV for over 30 years..She was on the Morning Exchange at WEWS-TV 5 from about 1979-87 with Fred Griffith (now on TV 3's Good Company) and the late Joel Rose.and had also been a cohost of Channel 8's PM Magazine with Michael Stanley. Notice Jan's dress..very 70's style..classy..
Notice also the Weather dials..Old fashioned in the age of radars and weather satellites. Thanks to Videoholic 50's-70's (Ray Glasser) for this nice clip..
Just wanted to give a report on the Ghoulardifest October 17-19. 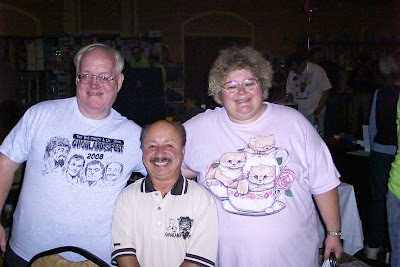 It was a big success..I finally got to meet 3 men who have become heroes to me..Big Chuck Schodowski, Lil John Rinaldi and Bob "Hoolihan" Wells..They were there the entire weekend, and it was awesome..I was always told they were very approchable and friendly to fans, and that is so true..They do not act the "TV Star"..Very refreshing in this day and age..
everything, it was all very much family friendly. Big Chuck's book was introduced that weekend, and is selling well on Amazon.com..My review of "Big Chuck" will be forthcoming soon.. There were several question/answer sessions, moderated by "Doktor Goulfinger". a California Horror Host/historian as well as stories by Chuck, John and Hoolihan..They were among the highlights of the fest..
A special time Friday Night was sharing in Bob Wells' 75th Birthday celebration..
Saturday Morning was a recreation of a Skit "Readings By Robert" With Bob Wells and Chuck..
Aside from the book...There are 2 more new DVD's that Big Chuck is selling.. 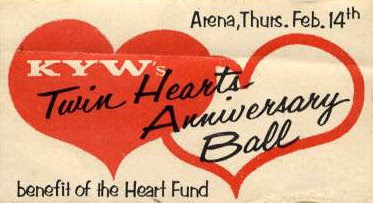 The 1968 Show is special because..The Show was moved to Saturdays September 28, 1968. The Channel 8 Program Director wanted the show to die on Saturdays so he could cancel it..Parts of skits from 1966-68 are here in an "award show" format. Within weeks the resulting controversy moved the show back to Fridays. 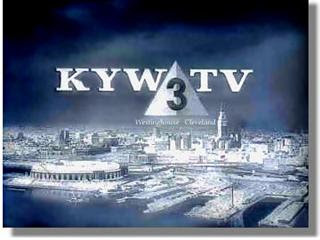 3 Holiday Specials (Summer, Halloween, Christmas) from Fox 8 in the 1990's-38 skits in all.. 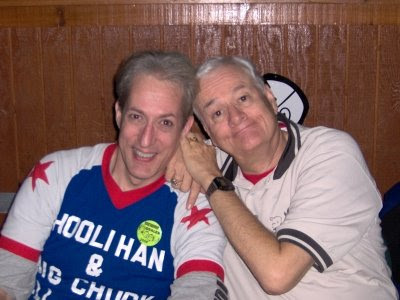 I have to credit the folks at the bigchuckandliljohn.com website, who did a lot of the Festival organizing, and especially Promoter Ron Garsteck, who put it all together..There is already talk about Ghoulardifest 2009..We'll keep you updated.. Personal note:It was great to meet Mike and Kris While and family, as well as several of the bigchuckandliljohn.com regulars..
Recreation of "Readings By Robert" with Hoolihan and Big Chuck. 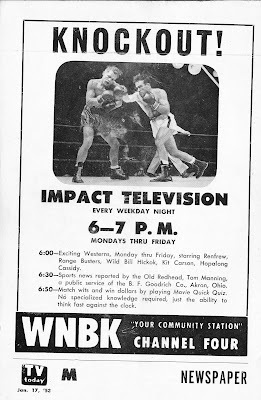 Chuck relates how they did this once on the air....Live..Because Chuck and Hoolie were mad at the TV 8 General Manager..Chuck said they would just deny it, because it wasnt on tape..
From December, 1952 TV Today:Ad for the "Ladies Shows" on WNBK-TV. 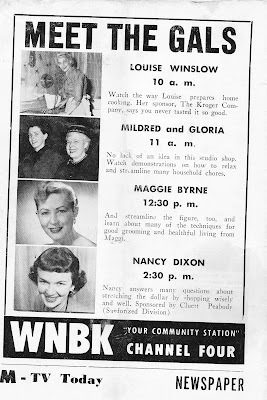 Mildred and Gloria were also on WTAM Radio for a number of years..Gloria Brown was at channel 4, then channel 3 until the early 60's..
Full 2-Page TV Guide ad from 1953 showing the nightly at 6PM westerns block on WNBK-4. 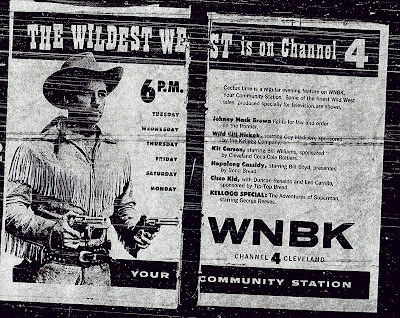 In the early years of television, western shorts were a staple of programming on just about all channels. 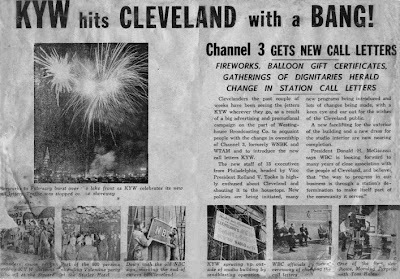 Second of a series on WKYC-TV's 60th anniversary..focusing more on the early 1950's. 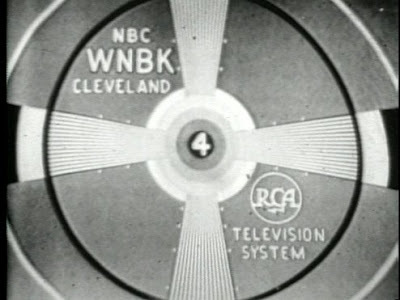 As we said earlier, The first early-morning TV programming in Cleveland premiered January 14, 1952, with the debut of Dave Garroway's Today Show on NBC..Channel 4 was becoming established as Cleveland's "Community Station" with a lot of local programming..News was still an afterthought, with only Camel News Caravan and a five minute report at 6:45 and 11PM weeknights. 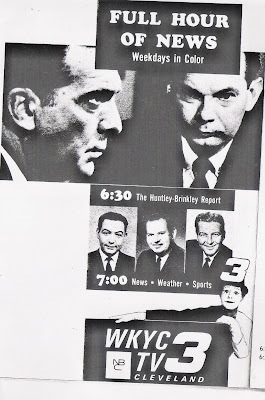 Most everything was live, as announcers like Jay Miltner and Tom Haley did some newsbreaks and hosted shows throughout the weekdays at Channel 4..
Below is the programming schedule for April 19-25, 1952 for WNBK..About a year before upping their power and changing from Channel 4 to Channel 3..
7AM Today-According to TV Today, including national and local segments by Tom Haley, Today was three hours long..I suspect the Haley segments were called "Ohio Today" and the 9-10 hour was hosted by Haley in Cleveland-This was Today's fourth month on the air.. 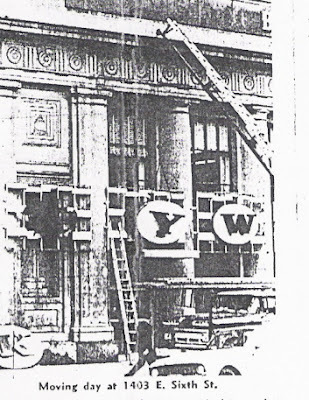 Noon Ruth Lyons' 50 Club- Brief NBC National version of what became a Cincinnati Institution..
Our final 2 posts of this series will be Encore postings of earlier KYW/WKYC articles to round out the 60 year WKYC series..Also soon I will have a Ghoulardifest review and a Big Chuck! Book review..
Cover for "Big Chuck! My Favorite Stories from 47 years on Cleveland TV"..Will be available for the first time Next week at Ghoulardifest. UPDATE:10:55 PM 10/10/08 Big Chuck! Publishers Gray and Company are now featuring the book on their website, with a free sample chapter..From what little I've seen, this will be a great read.. Remember in my last post when I said I would have Special news on the Ghoulardifest "In the next few days?" Sub title: My Favorite Stories from 47 Years On TV. Pages: 288 pages, with B&W Photos. Authors:Chuck Schodowsski with Tom Feran.. Available at the Ghoulardifest October 17-19th. Also:It will be available about a week later at your favorite bookstore in Northeast Ohio.. Courtesy The Cleveland Plain Dealer and Cleveland.com, Here is a Video News conference with Tom Feran, Chuck Schodowski, John Rinaldi, Mike Olszewski and Ghoulardifest promoter Ron Garsteck talking about the Ghoulardifest and the Book coming out, etc.. I encourage anyone who is a fan..You have to make this weekend!..It will be a blast!! 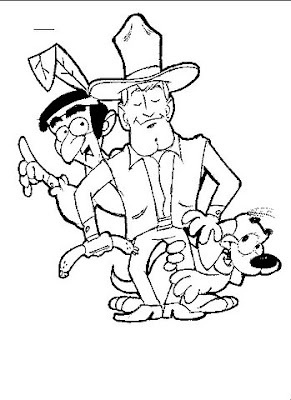 Here is an original drawing by John Thornberg, who did the artwork for the Hoolihan and Big Chuck Show-"More to Come" bumpers and such..The Kielbasy Kid, His faithful Indian companion Kishka and King The Wonder Dog..I am of the opinion that this would be good enough to animate if Mr. Thornberg would ever want to..He is an very talented man..
As we have seen, there is no shortage of Ghoulardi/Hoolihan and Big Chuck/Lil John skits on YouTube and other video sharing sites..Just found this skit last night..Featuring The Beverly Hillbillies' Buddy Ebsen in a Kielbasy Kid skit with Big Chuck and Hoolihan..Though The thread title says 1970, I think this could be from 1969 or no later than 1971 (When Hillbillies was Canceled by CBS)..It was a practice of certain CBS stars to appear on local affiliates to plug their latest project or just the CBS show they were starring in..Thanks to bigchuckandliljohn, YouTube member, for uploading this originally..
We should have some special news regarding the Ghoulardifest in the next few days..stay tuned..
Cleveland sports fans have always been among the most passionate in the USA..I've been a Browns, Indians , Cavs, and Pro Hockey fan since around 1970..I'd like to introduce a pair of new links today..To the Cleveland Fan.com, and it's companion message boards. The Cleveland Fan.com is a clearinghouse of all things Cleveland Sports, such as articles, blogs, web feeds, etc..For the real Cleveland Sports Fan..The Forums have loads of Topics on every conceivable spectator sport, pro anc college, in Northeast Ohio..Plus many off topic boards..Very well done..The Cleveland Fan.com serves as an unofficial message board for Sportstime ohio.com.. I highly recommend these sites..Swerb and Consigliere are two major folks that run the boards and the site and they do an excellent job. 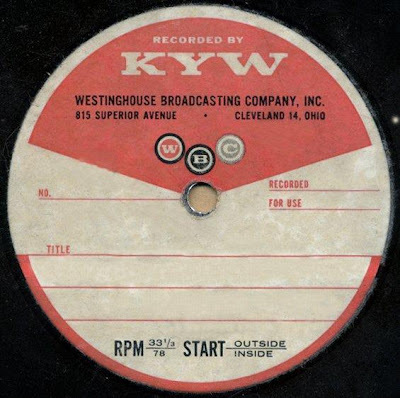 Thanks to Swerb for the link to Cleveland Classic Media.. Here, courtesy of the Internet Archive, is a full episode of the ABC animated series, Calvin and The Colonel. Created by Freeman Gosden and Charles Correll, the men behind Amos and Andy, This series was one of several attempts by ABC to repeat the success of the "Flintstones." The plots revolved around a Fox and a Bear in a large Southern City, voiced by Gosden and Correll in their Amos and Andy Voices. Produced by Joe Connelly and Bob Mosher, the series premiered October 3, 1961 Tuesdays at 8:30. After the first 6 episodes (ending November 7) the series was shelved until January 27, 1962, when it ran Saturday nights 7:30 till the end of the run, September 22, 1962. From what little I've seen it wasnt a bad show, despte the limited animation..I also like the jazzy theme music..Here is "Wheeler Dealer" with original commercials, First aired February 3, 1962..